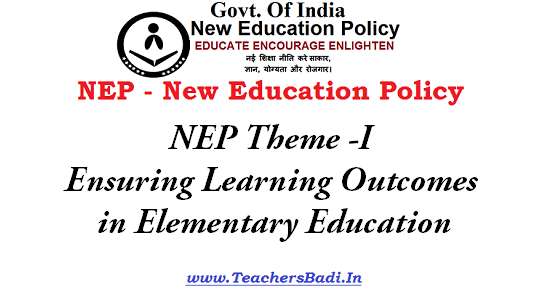 NEP/New Education Policy theme I. Ensuring Learning Outcomes in Elementary Education: In elementary education, despite improvements in access and retention, the learning outcomes for a majority of children continue to be an area of serious concern. Studies are showing that children are not learning the basic skills during their schooling. Many children who reach grade V cannot read simple texts and cannot do simple arithmetic calculations. The examination results of the children are poor. Concerted efforts are required to ensure that a minimum set of cognitive skills are acquired by all children during eight years of elementary education. Learning Outcomes: The National Policy on Education 1986, and the Programme of Action 1992 emphasised that Minimum Levels of Learning MLLs) should be laid down and children’s learning should periodically be assessed to keep a track of their progress towards ensuring that “all children acquire at least the minimum levels of learning”. Learning Outcomes are assessment standards indicating the expected levels of learning that children should achieve for that class. These outcomes can be used as check points to assess learning at different points of time. The learning outcomes would help teachers to understand the learning levels of children in their respective classes individually as well as collectively. Learning outcomes should be the point of reference for conducting achievement surveys. Hence it is necessary that the defined Learning Outcomes are also shared with parents and community at large. It has now been proposed to include the defined Learning Outcomes in the Central Rules of the Right of Children to Free and Compulsory Education (RTE) Act, 2009. These Rules will be applicable to all schools including government, aided and private schools. The NCERT has developed draft Learning Outcomes for each class in Languages (Hindi, English and Urdu), Mathematics, Environmental Studies, Science and Social Science up to the Elementary stage. Care has been taken to develop the outcomes following consultations with States, UTs, SCERTs and education experts from organizations including civil society organizations. The Learning Outcomes developed by NCERT are the minimum levels of learning to facilitate the monitoring of students against expected benchmarks. The National Council of Educational Research and Training (NCERT) conducts periodic national surveys of learning achievement of children in classes III, V and VIII and X. Four rounds of National Achievement Survey (NAS) have been conducted so far for class V and three rounds for classes III & VIII. These surveys reveal improvement in learning achievement levels of pupils, in identified subjects from first round to fourth round. Findings of the NAS at class X indicates that privately managed schools performed better than Government and Government Aided schools, in all the subjects and in two subjects Girls outperformed boys. However, only first round of NAS has been conducted at class X level, therefore, it is not possible to comment on the comparative learning achievement. From current year onwards, Government has decided to conduct National Achievement Survey with district as the sampling unit. In order to focus on quality education, the Central RTE Rules have been amended on 20th February, 2017 to include reference on class-wise, subject-wise Learning Outcomes. The Learning Outcomes for each class in Languages (Hindi, English and Urdu), Mathematics, Environmental Studies, Science and Social Science up to the elementary stage have, accordingly, been finalized and shared with all States and UTs. These would serve as a guideline for States and UTs to ensure that all children acquire appropriate learning level. The students learning assessment will be according to the Learning Outcomes developed by NCERT. Under the Centrally Sponsored Schemes of Sarva Shiskha Abhiyan (SSA) and Rashtriya Madhyamik Shiksha Abhiyan (RMSA), the State Governments and UT Administrations are supported on several interventions to improve teaching standards, including regular in-service teachers’ training, induction training for newly recruited teachers, recruitment of additional teachers for improving pupilteacher ratio, academic support for teachers through block and cluster resource centres, Maths and Science kits, Lab equipment, special teaching for learning enhancement, ICT facilities in schools, introduction of vocational education component at the secondary level and activities under ‘Unnati’ project for improvement in English language skills. The States are implementing reforms such as early grade reading, writing, comprehension and maths programs in conjunction with defining and measuring learning outcomes. The NCERT has completed 3 rounds of National Level Achievements Survey for Classes –III, V, & VII/VIII. States have been given funds to conduct State level achievement surveys and the States are conducting State level learning achievement surveys which are at different stages of conducting one or more rounds of SLAS. However, even with all these reforms, there is a need to explore the various approaches to improve teaching–learning at the elementary stage. There is a need to understand the reasons of low learning achievement levels in elementary schooling, assess the system of Continuous and Comprehensive Evaluation and suggest ways and methods of improving the learning outcomes of school children which would result in enhancing the quality of elementary education. The quality issues and determinants thereof such as ensuring availability of trained teachers, good curriculum and innovative pedagogy that impact upon learning outcomes of the children need to be addressed on priority basis. What in your view are the reasons for the poor performance of your children in the schools? How do we ensure that children learn the basic language and numeracy skills in the schools? How do we use technology to ensure real time availability of teachers? Should there be dedicated teachers for classes 1 & 2. What needs to be introduced in teacher training for improving teaching learning process at foundation level of schools? Should there be any special measures for primary schools to make them attractive for students, parents, teachers like colourful furniture, rugs play way toys, charts, pictures etc. Do you think games, art and confidence building measures should be introduced from primary level itself? What should be the student assessment systems? How many languages should be available for children to learn at elementary level? How do we factor in pre primary/ play school industry in our country that seems to be mushrooming? States to highlight in which areas do they seek international partnerships?